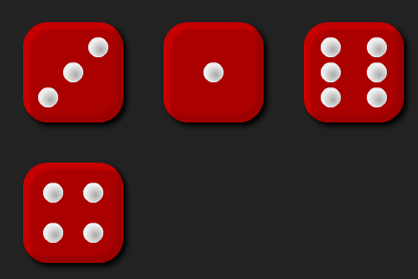 There are four dice, each of them with faces labelled from 1 to 6. When the dice are rolled they can be combined in twenty four different ways to make a four-digit number. 1234, 1243, 1324, 1342, 1423, 1432, 2134, 2143, 2314, 2341, 2413, 2431, 3124, 3142, 3214, 3241, 3412, 3421, 4123, 4132, 4213, 4231, 4312 or 4321. Now pick four different four-digit numbers from the list and round each of them to the nearest multiple of 1000. For example, 1324 rounds to 1000, 2314 rounds to 2000, 4312 rounds to 4000 and 4123 rounds to 4000. Do the four four-digit numbers you choose ever all round to the same multiple of 1000? Do the four four-digit numbers you choose ever round to unique multiples of 1000? Visualising. Rounding. Creating and manipulating expressions and formulae. Mathematical reasoning & proof. Recording mathematics. Dice. Generalising. Working systematically. Addition & subtraction. Interactivities.